[S-1380942765] 1910 United States Federal Census, Ancestry.com, (Online publication - Provo, UT, USA: Ancestry.com Operations Inc, 2006.Original data - Thirteenth Census of the United States, 1910 (NARA microfilm publication T624, 1,178 rolls). Records of the Bureau of the Census, Record Group 29. National Archives, Was), Year: 1910; Census Place: Ashland Ward 1, Ashland, Ohio; Roll: ; Page: ; Enumeration District: ; Image: . [S-1379433292] Social Security Death Index, Ancestry.com, (Online publication - Provo, UT, USA: Ancestry.com Operations Inc, 2011.Original data - Social Security Administration. Social Security Death Index, Master File. Social Security Administration.Original data: Social Security Administration. Social Security D), Number: 276-62-0612; Issue State: Ohio; Issue Date: 1973. [S-1380565100] 1920 United States Federal Census, Ancestry.com, (Online publication - Provo, UT, USA: Ancestry.com Operations Inc, 2010. 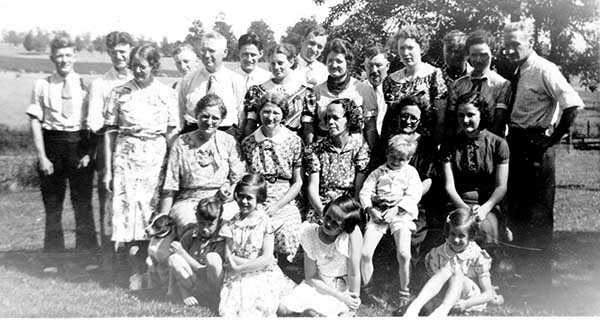 Images reproduced by FamilySearch.Original data - Fourteenth Census of the United States, 1920. (NARA microfilm publication T625, 2076 rolls). Records of the Bureau of the Census, Reco), Year: 1920; Census Place: Orange, Ashland, Ohio; Roll: T625_1347; Page: 5B; Enumeration District: 15; Image: . [S-1380633219] 1930 United States Federal Census, Ancestry.com, (Online publication - Provo, UT, USA: Ancestry.com Operations Inc, 2002.Original data - United States of America, Bureau of the Census. Fifteenth Census of the United States, 1930. Washington, D.C.: National Archives and Records Administration, 1930. T626, ), Year: 1930; Census Place: Orange, Ashland, Ohio; Roll: ; Page: ; Enumeration District: ; Image: . [S-1380941343] 1900 United States Federal Census, Ancestry.com, (Online publication - Provo, UT, USA: Ancestry.com Operations Inc, 2004.Original data - United States of America, Bureau of the Census. Twelfth Census of the United States, 1900. Washington, D.C.: National Archives and Records Administration, 1900. T623, 18), Year: 1900; Census Place: Milton, Ashland, Ohio; Roll: T623_1237; Page: 5A; Enumeration District: 7. [S-1379431024] Ohio Deaths, 1908-1932, 1938-1944, and 1958-2007, Ancestry.com and Ohio Department of Health, (Online publication - Provo, UT, USA: Ancestry.com Operations Inc, 2010.Original data - Ohio. Division of Vital Statistics. Death Certificates and index, December 20, 1908-December 31, 1953. State Archives Series 3094. Ohio Historical Society, Ohio.Ohio Dep), Certificate: ; Volume: . [S-1370068979] Web: Ohio, Find A Grave Index, 1803-2011, Ancestry.com, (Online publication - Provo, UT, USA: Ancestry.com Operations, Inc., 2012.Original data - Find A Grave. Find a Grave. http://www.findagrave.com/cgi-bin/fg.cgi: accessed 23 December 2011.Original data: Find A Grave. Find a Grave. http://www.findagrave.com/cg).